Those homeschool days when you get through everything you planned with your kids (and the whole day runs smoothly) can feel worthy of celebration at times. When days like that are few and far between, it can be discouraging. Feelings of frustration and discouragement come flooding in as you wonder what you are doing wrong. There is so much to get done in a typical homeschool day, from the lessons to the laundry to getting everyone to their various activities, it seems impossible to get it all done! So you might decide to come up with a bigger and better plan because you are determined to turn things around. You create a master plan and map out every minute of your day. But when you give it a try you find out that the minute-by-minute playbook is impossible to follow. Not to mention that the joy in your homeschool is gone and your relationship with your kids is deteriorating. So what is a homeschool mom to do? Well, first, don’t give up! There is hope for more productive days. Of course you don’t want to damage your relationship with your children or diminish their love for learning, simply for the sake of productivity. Your real desire is simply focused time on tasks and using your time well so that you can provide your children with the best homeschool experience possible. And that is something that can be done! 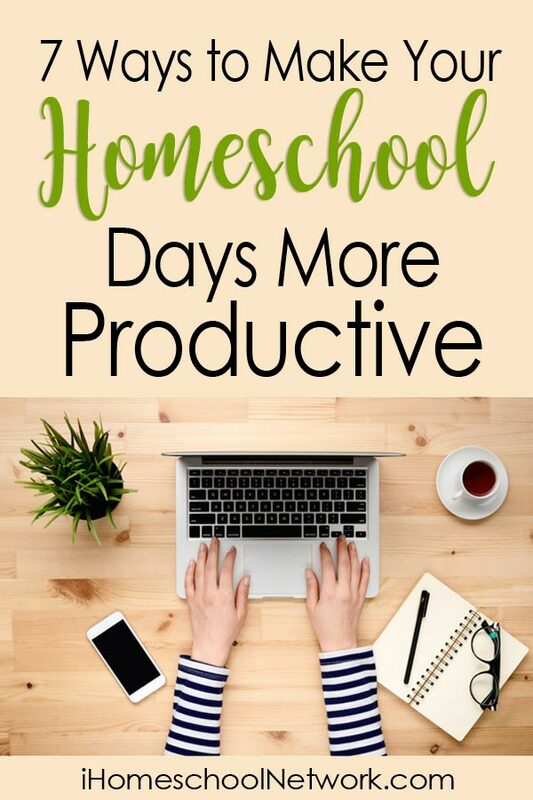 What you need are practical, doable solutions to make your days run smoothly and keep the joy in your homeschool as you continue to grow in your relationship with your children. Getting up before your children gives you a head start to the day and all homeschool moms can use a good head start. 🙂 Having that alone time to ease into the day, read, pray and drink a cup of coffee can be a sanity saver. Getting up early can be near impossible if you are up during the night with a baby or toddler or have some other situation that keeps you from getting to bed at a decent time. So, not everyone can do this. But if you can, make sure to set your alarm just a bit before your children wake up and give yourself this time of peace. A neat and organized space typically means a more functional space. And in turn everyone can be more efficient and productive. Productivity doesn’t have to mean that your children are cranking out a ton of work, because that’s not the point, but it does mean using your time well to get tasks accomplished. It’s difficult for anyone to concentrate and be productive in a messy, disorganized area so take the time with your children to keep your learning area(s) neat, tidy and clutter free. If organization is an area you’d like to work on, you’ll want to read through this 5-day homeschool organization series. When you have everything prepped ahead of time you’ll be able to get right to the work planned for the day. This creates less distraction, less potential for your kids to wander off, and they won’t have to sit and wait for you to be ready. Overall, your day will run more smoothly and the time spent with your children will be more productive and enjoyable. There are so many wonderful planners available to help keep homeschoolers on track. If you aren’t already using a planner, or the one you are currently using isn’t working, search a planner that meets your needs. Homeschool Planet offers a complete online planner to organize home, homeschool and work. If you have a lot to juggle this tool might be a life-saver for you. It’s very difficult to feel productive when your schedule is completely overloaded. An overloaded scheduled creates anxiety, overwhelm and stress. Plus, when you have a list of 20 things that “need” to get done and you can only realistically get 5 of them completed, you will likely feel dissatisfaction about not getting much done. But if you are more realistic to begin with and have only 5 things on your list to accomplish, and accomplish them all, you will feel great about your productivity! There are days that are bound to go off track. Rather than get to the end of the day having completed some of the less important items on your list, you can increase your chances of completing what’s most important by designating what those things are in the first place. So, if your read aloud time is most important for your homeschool then identify that as your MIT for the day. Or maybe one of your children desperately needs to do some math review. Then you can make that your most important task for the day. Designate specific times for clean-up, prep, grading, etc. Building time into your schedule for cleaning up and organizing, prepping materials and correcting or grading can make a big difference in your homeschool. Rather than try to squeeze those things in when you have time, build them into your schedule and designate a specific time to get them done. We homeschoolers tend to push these “minor” things aside thinking we’ll get to them when we can but that’s when we get disorganized and thrown off track. Keeping up in these areas can greatly improve how smoothly your days run. Do your best to plan, prioritize and follow through but remember that it will never be perfect. You won’t always be able to get it all done and that’s okay! If nothing else, you can use those unproductive days as a life-lesson with your children. To teach them that life happens, things come up and we all need to be flexible and make adjustments as we go along. Monica Lynn is a wife and mom to three lively children who unexpectedly began their homeschool adventure in 2012. Since then, her family has enjoyed the flexibility and freedom the homeschool life affords while managing to survive the most challenging days. When she’s not schooling or enjoying a good read aloud with her children, you can find her sipping a cup of coffee and writing at EnjoytheLearningJourney.com where she shares homeschool encouragement and tools and resources for raising grateful, compassionate and responsible kids.